Autumn has not arrived yet, but the hot summer weather has peaked and you probably have more of an appetite. Here are some fun events for those who love the local foods. 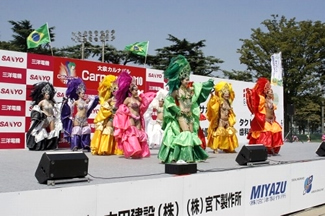 Every year, many people with different ethnic and national backgrounds gather in Oizumi for this event. Try different foods from around the world at the World Gourmet Alley, and watch the festive samba contest, a small-scale version of the contest held in Rio de Janeiro. Delicacies of Brazil, the U.S., Sri Lanka and other countries are offered. Japanese cultural and handicraft workshops, including tea ceremony and others are also offered. There are stage performances, too. Please be there and enjoy mingling with people from around the world. Admission is free. From within Gunma and neighboring prefectures, approx. 100 shops and restaurants gather to offer their specialties. 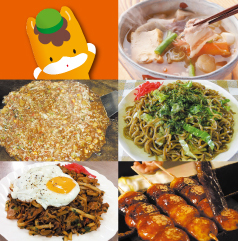 Udon or wheat noodles, Yakimanju or roasted buns with or without bean paste, and pork dishes are among them. Fresh local produce will be on sale. There will be events featuring Gunma-chan, too. Admission is free. On the premises of the Tomioka Silk Mill, a concert called The World Heritage Theater will be held from Sept. 17(Sat) to Sept. 19 (Holiday), featuring first-rate artists. Tickets are on sale. Coinciding with the concerts and Japanese traditional craft exhibition, there will also be a tourism fair, where do-it-youself type events and tasting of food samples of local specialties are offered to enable visitors to get the feel of what the western part of Gunma can offer. As a special treat, an old electric train that has been restored for this summer is scheduled to run. During Silver Week (a series of national holidays in the 4th week of September), visit Kawaba Den-en Plaza, a very popular road station in Kawaba-mura, where you can enjoy beers and dairy products made on the premises. Food stalls, street performances, and mini concerts will also be offered. Oide means "Please come" in English. Phonetically, it sounds like hot water has sprung in Japanese, so they named the festival "oide" in hopes of welcoming many people to Minakami hot spring. The procession of portable shrines through the streets of Yubara is followed by a group of Oide dancers. You can jump right in the group and dance, if you want to. Portable shrines are carried up to the top of the stone steps of Ikaho. On the 19th and 20th, floats are carried along the streets of downtown Ikaho. Anyone who is four years or older is welcome to join the procession. There is no need to wear a festival costume, so why not take part?